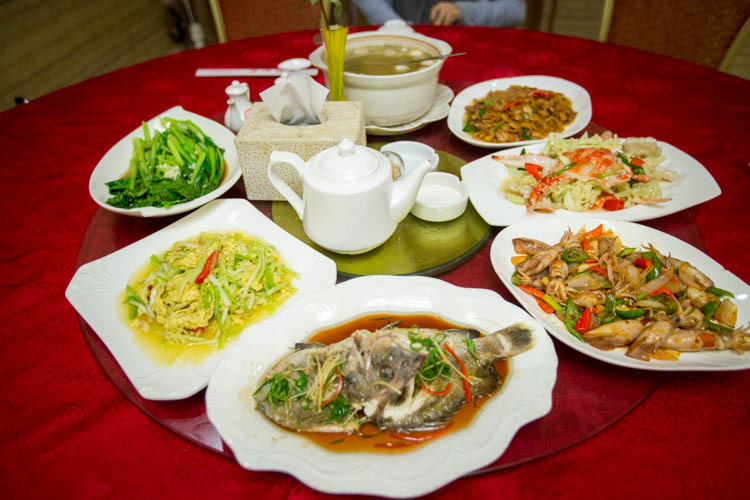 Recently we went on a short trip to Quan Zhou and for us the highlight was really the food! 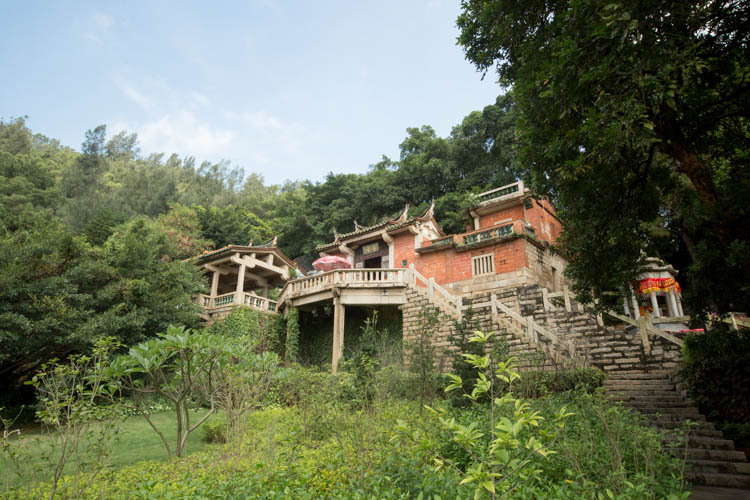 Quan Zhou would be an ideal destination for the more matured generation, a great place to bring your parents or even grandparents for a holiday. 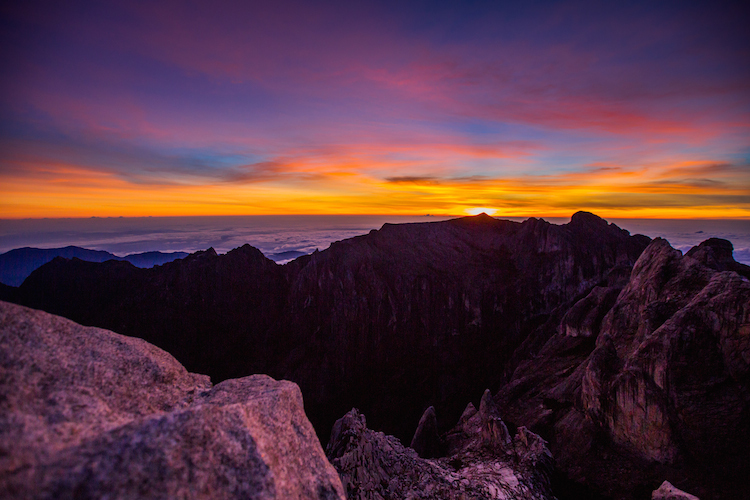 Most conveniently, Tigerair now flies direct from Singapore to Quan Zhou. 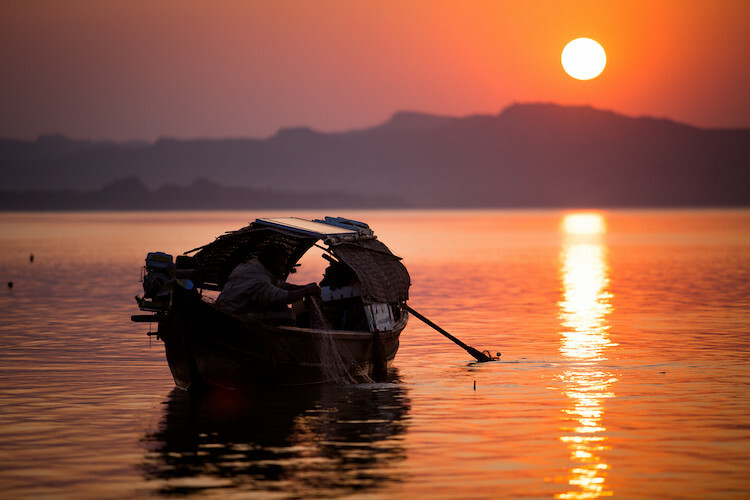 Quan Zhou used to be the largest port in Asia about a 1,000 years ago! 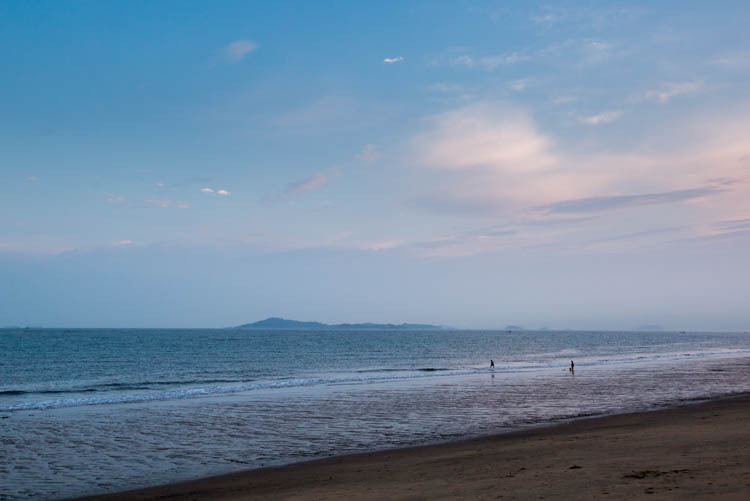 But fast forward to today, it’s a regular seaside city which still attracts tons of domestic tourists. 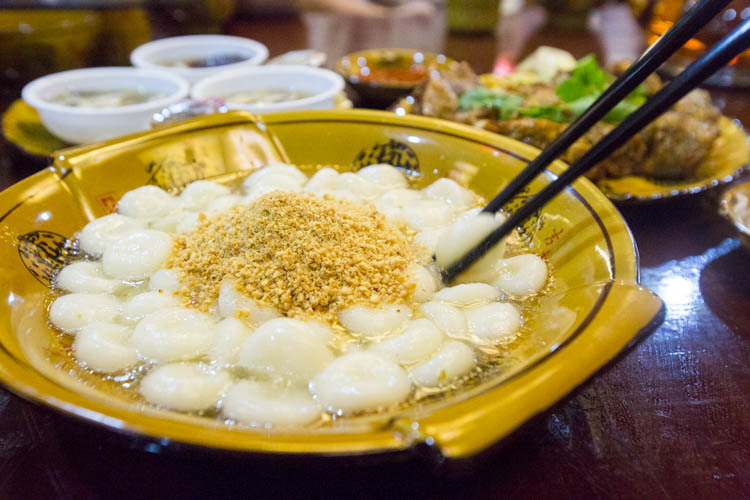 Quan Zhou is actually part of Fujian province and its cuisine is quite similar to our home cooked Chinese dishes back in Singapore. So this would be a great place to bring your older folks as they will have no problem adapting to the food here. You will notice that they will serve a soup dish, fish, vegetables, seafood (usually sotong) and a meat dish. 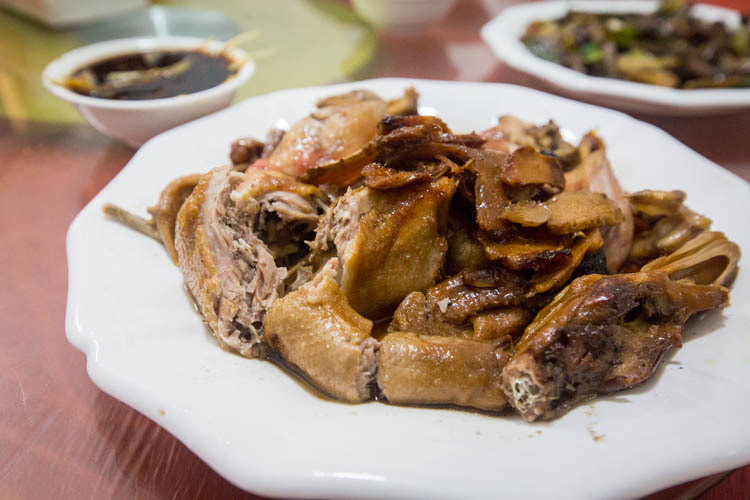 One of the local’s specialty would be the traditional Jiangmu Ya (Ginger Duck) which was one of our favourites! 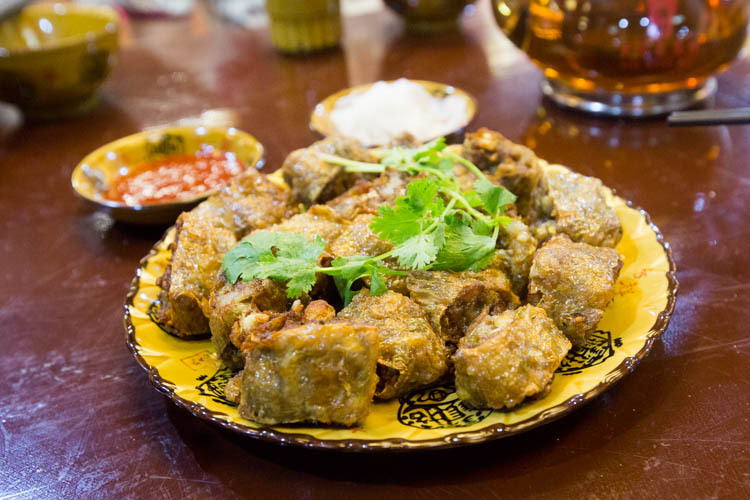 You have to dip the meat into a separate dish of ginger and vinegar which gives the dish a really interesting taste. 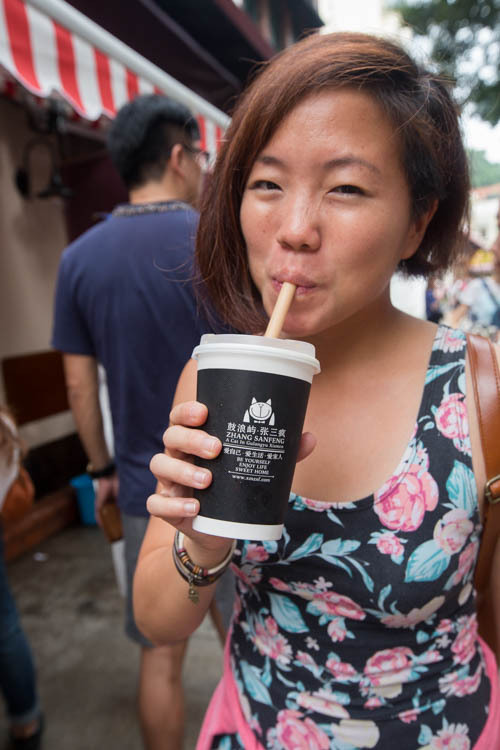 The ginger taste is not that strong actually, in case you’re not a fan of ginger like us. This has gotta be our ultimate favourite – OYSTER EGG (right photo below)! We were shocked at the ratio of oysters to egg! In Singapore, you could possibly count the number of oysters with one hand but over here, it’s impossible! It almost felt like there was hardly any egg and all oysters only. But this dish is really awesome, wins hands down. We ate fried oyster egg for almost every meal! 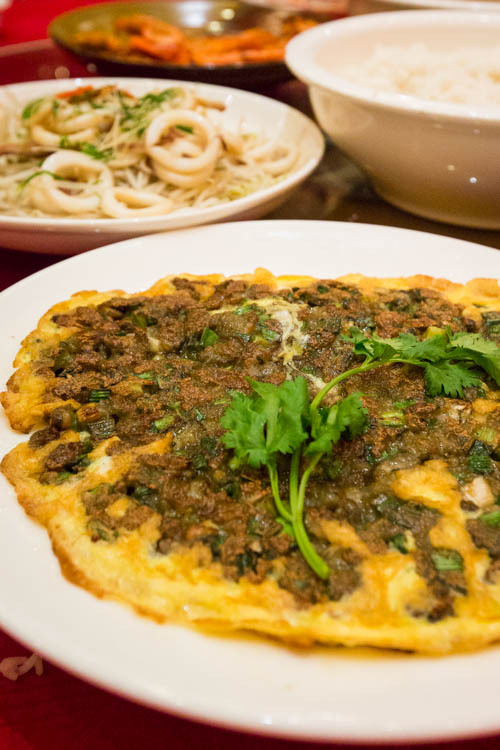 Tip: All oyster egg lovers must try the oyster egg in Quan Zhou! It’s the BEST! Okay, the next dish, frozen siphon worms, is kinda gross. BUT, it tastes delicious! No joke. In fact, it was Daniel’s favourite dish! 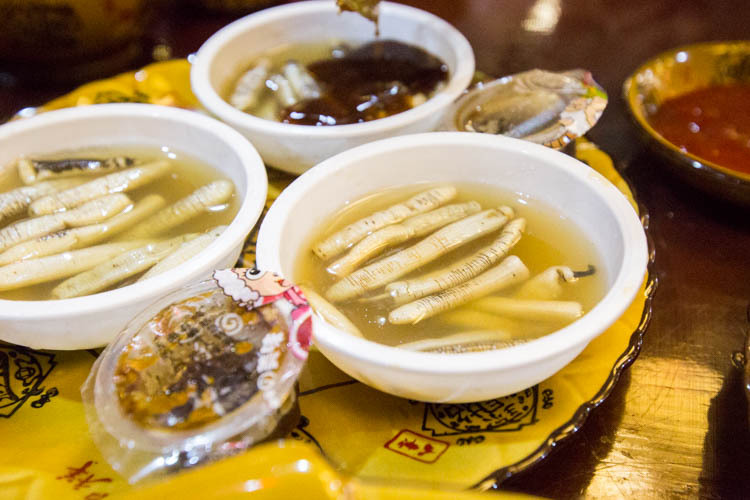 The dish below is actually a bowl of sea worms. You have to add in the packet of vinegar into the bowl and eat it together. Its texture feels like mushroom and it tastes not too bad. 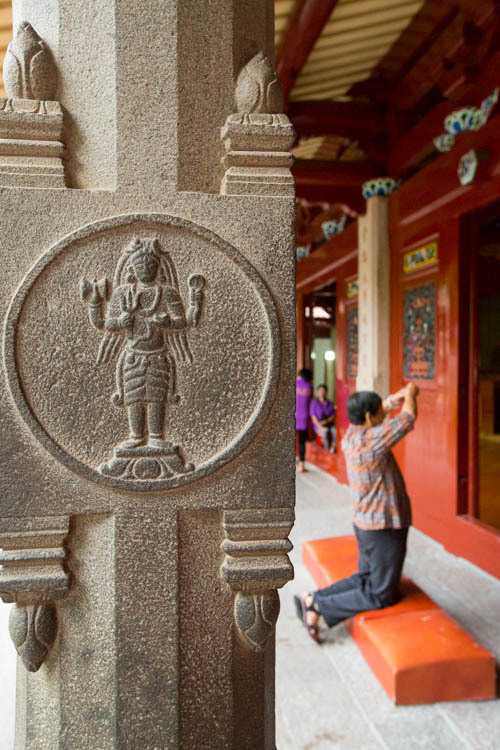 Quan Zhou is quite a religious city with numerous temples dedicated to the various deities. 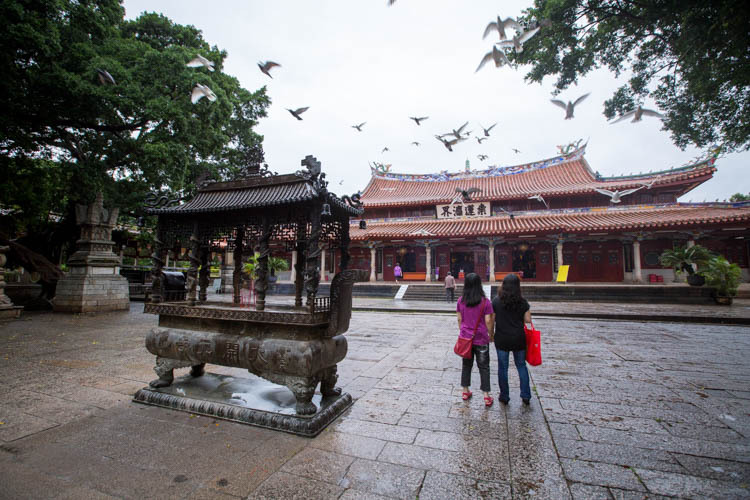 One of them is Kai Yuan temple, which is also one of the oldest and largest buddhist temple built during the Tang dynasty. One interesting factor about this temple would be the Hindu influence which can be seen in parts of its architecture like the pillar in the right photo below. The other amazing thing would be the pagoda (left photo below) that has been built more than 700 years ago. 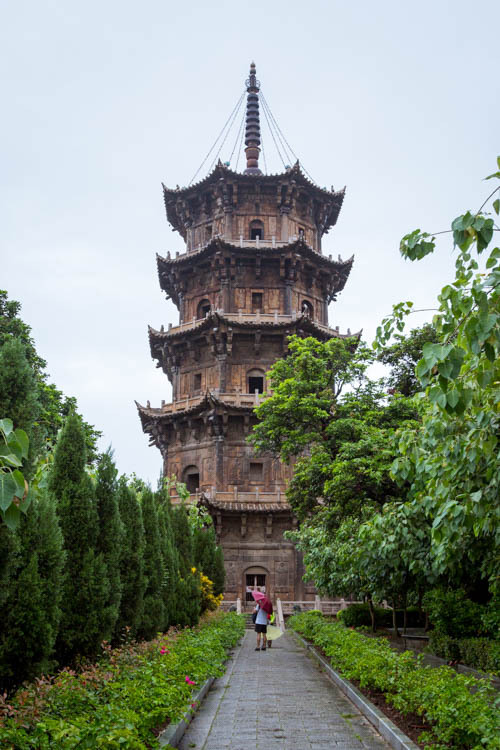 This pagoda has withstood countless typhoons and earthquakes and it’s still standing strong till date! 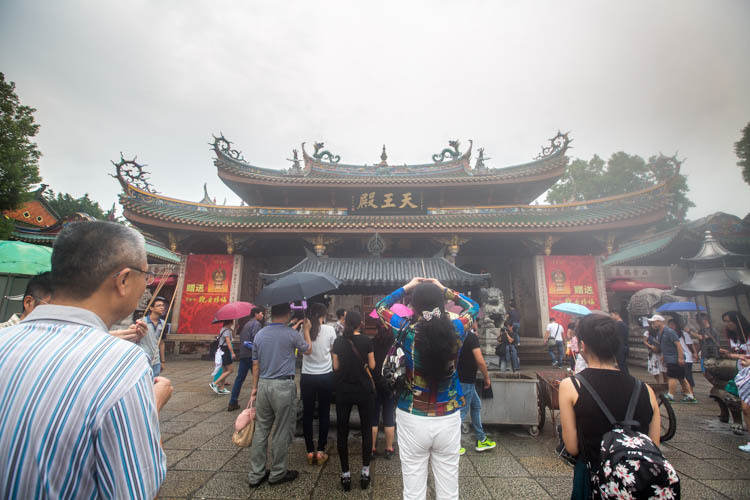 The other temple that we visited was Nan Pu Tuo which is a famous temple that was founded during the Tang dynasty too. It was quite fun exploring the temple as it was much larger than we expected! 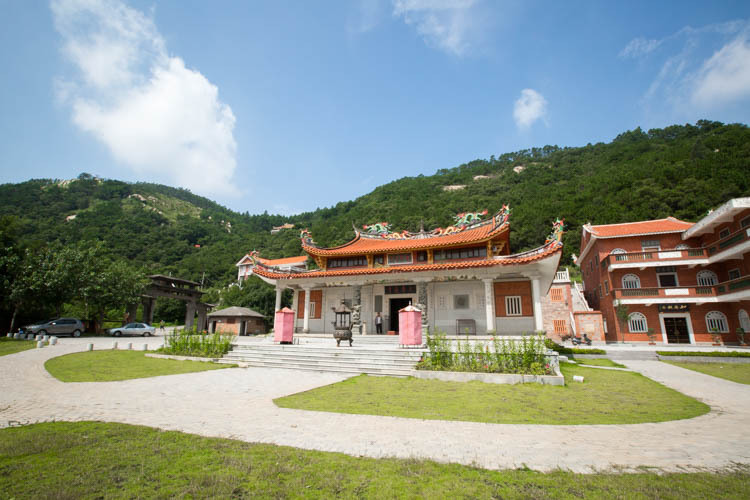 Tip: If you have the time, buffer in around 2 hours to do a simple trek up to the top of Mt Putuo which is located right behind the temple. 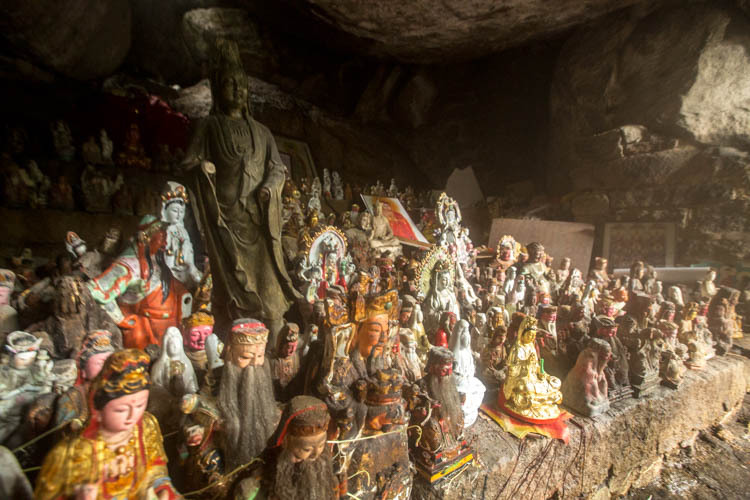 There were quite a few ‘caves’ at the temple with a lot of different buddha statues inside. The next temple is Jin Jiang’s most famous temple, Cao’an Temple. 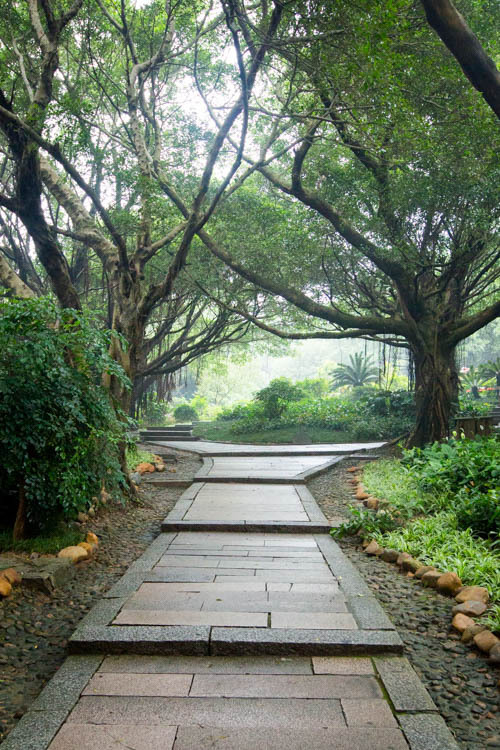 It’s location is quite secluded and it was said to be built by the Chinese Manicheans during the Song Dynasty. But overtime, the locals viewed this place as a Buddhist temple. We really enjoyed watching the performances after our delicious local lunch! 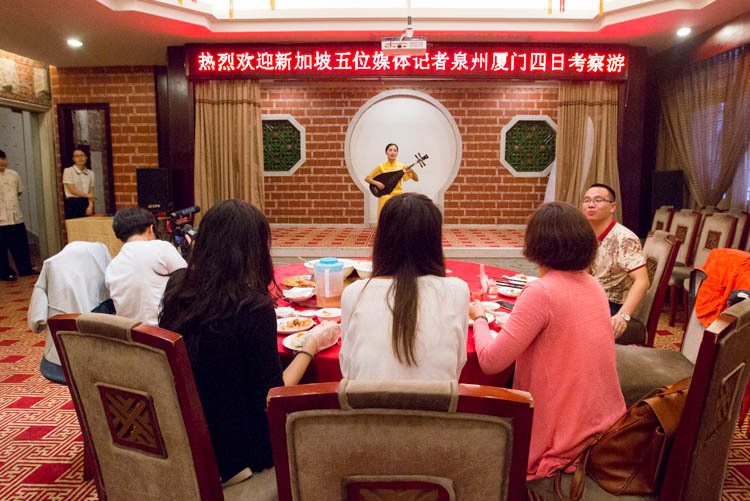 Apparently this restaurant only organise the performances when there’s a booking. And we were the only patrons in the restaurant that day! Which meant they performed for us only, we felt so honoured! Check out the Chinese captions at the top of the stage! 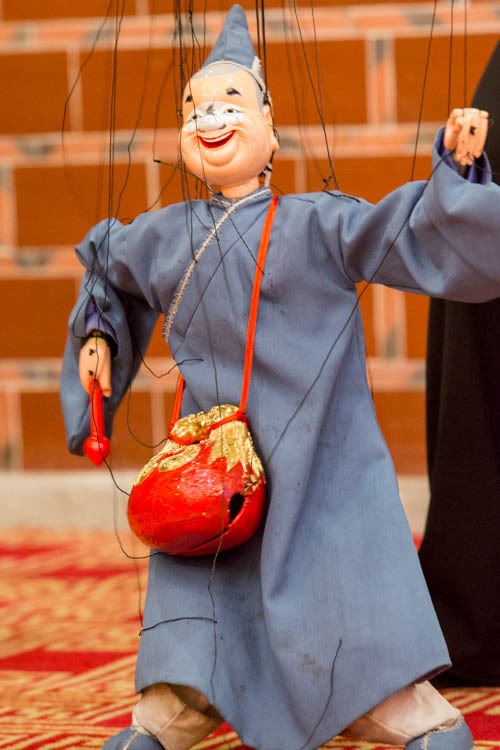 The 2 performances below were our favourites, especially the puppet guy on the right! He was really good! And the thing I loved most was the smile on his face throughout the entire performance. 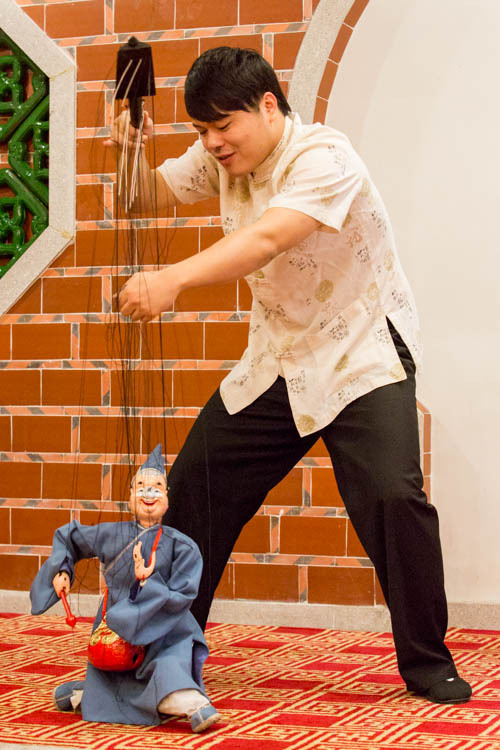 We could tell that he really enjoyed what he was doing 🙂 We later found out that some puppets have as many as 36 different strings! We really wonder sometimes how come the strings never ever get entangled….hmm.. 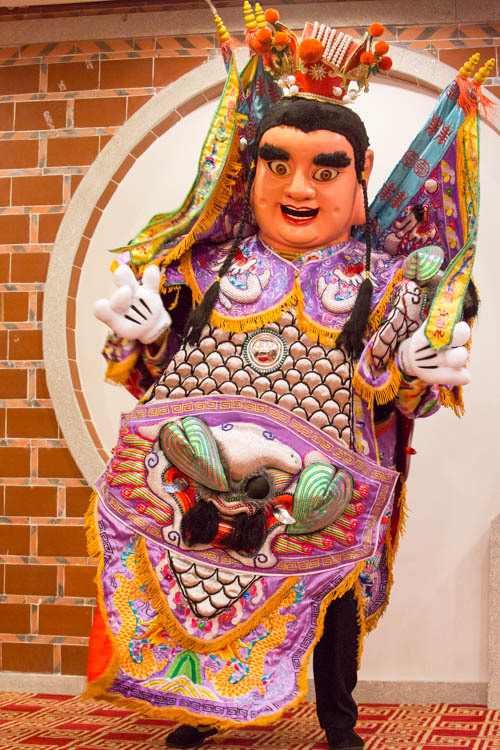 The “Nezha that was dancing to techno” performance was a little weird and ridiculous though. But we had quite a good laugh over it. 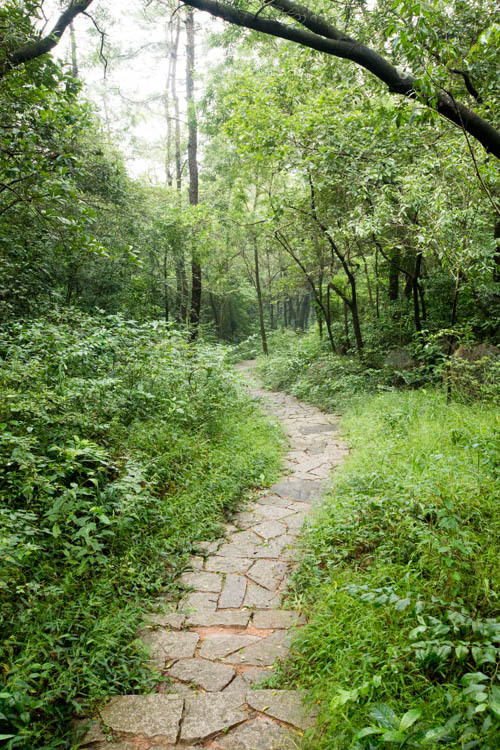 There was just this overwhelming sense of calmness and peace as we took a nice morning stroll at the Qing Yuan Shan National park. The air was exceptionally crisp and fresh; we were totally surrounded by greenery. It was such a good retreat for our soul. 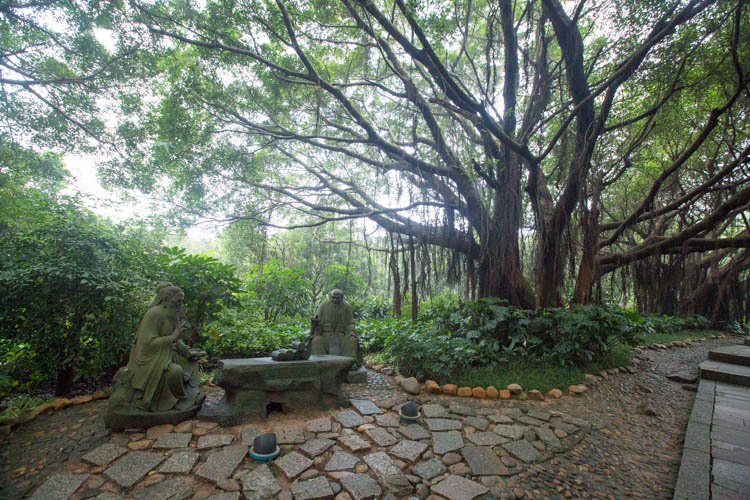 The stone statue of Lao Zi in the photo below is one of the main reason why people visit the Qing Yuan Shan as well. 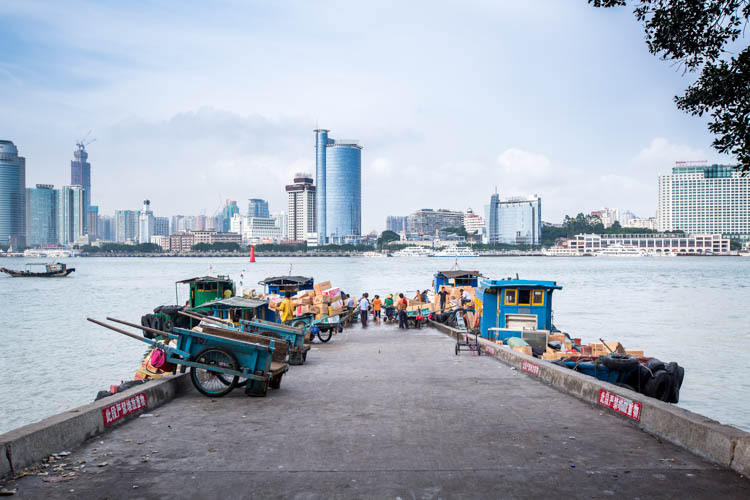 It’s one of the iconic landmarks of Quan Zhou and apparently if you haven’t taken a photo with the Lao Zi statue, you haven’t been to Quan Zhou. 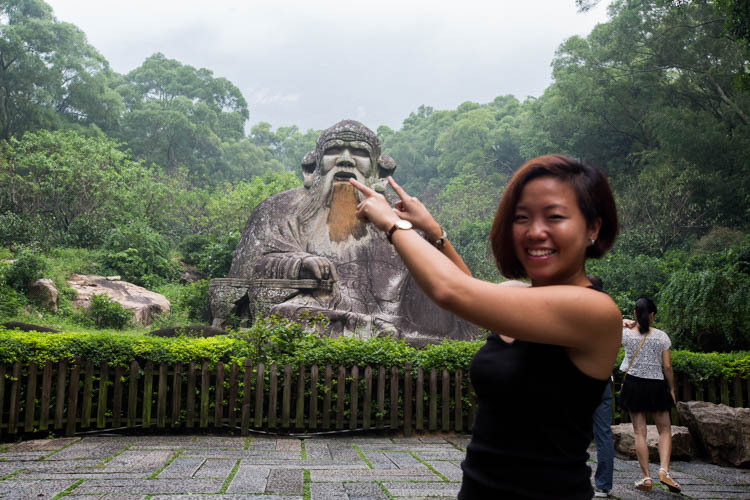 There’s a local saying that if you can touch the nose of Lao Zi, you can live up to 120 years. But if you can touch the ears, you can live up to 160 Years! 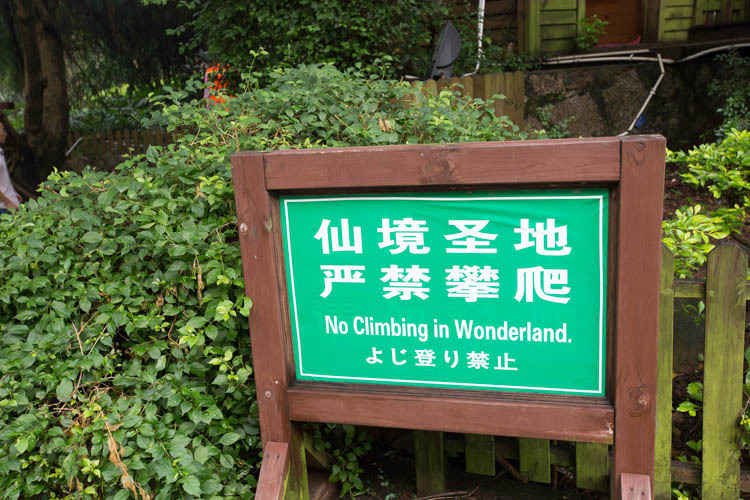 Unfortunately, no climbing in Wonderland. 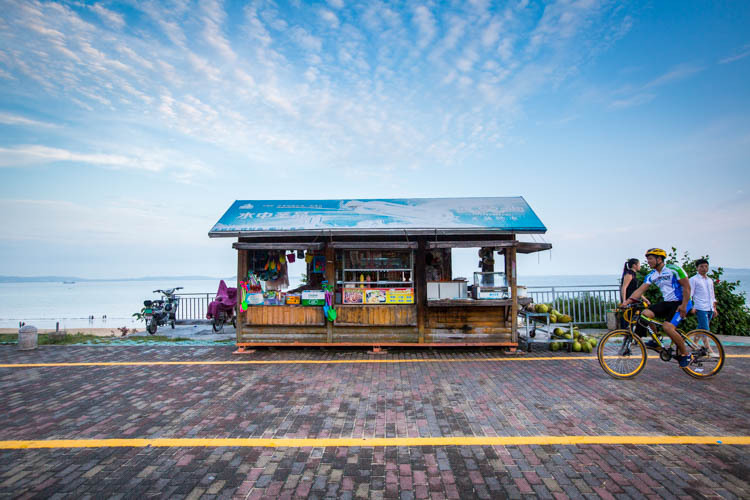 We took a day trip to Gulangyu Island which is a popular holiday destination for the locals. 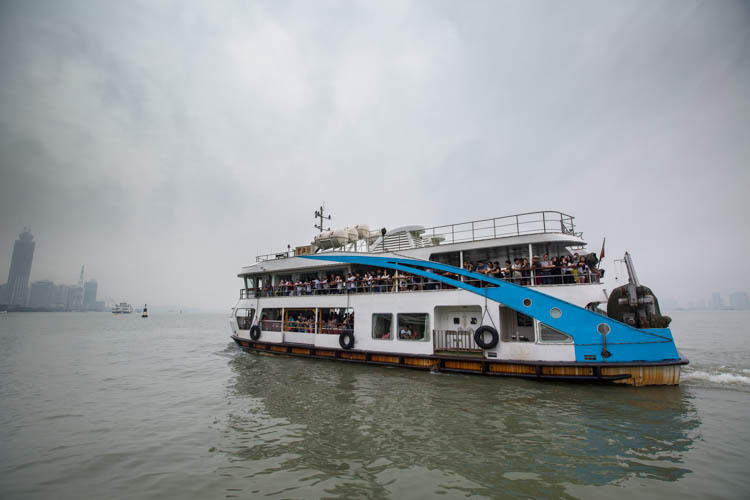 It’s easy to get there via a ferry from Jin Jiang (where we were at in Quan Zhou). 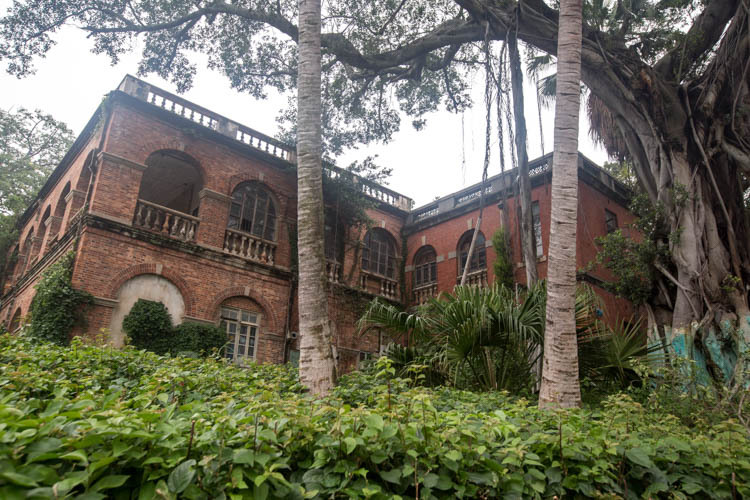 Gulangyu Island was quite a strange place, we didn’t know quite how to describe it. 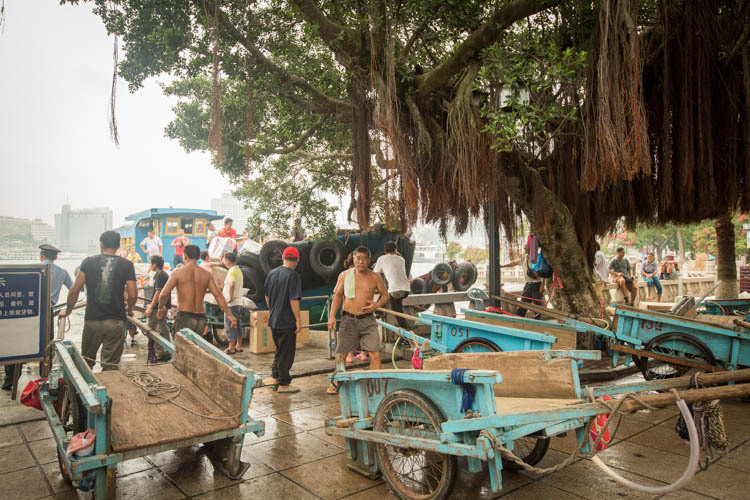 Somehow on one side, it felt like we were back in the past, with the coolies without shirt and a towel draped around their neck, pulling the carts piled up with goods on them. 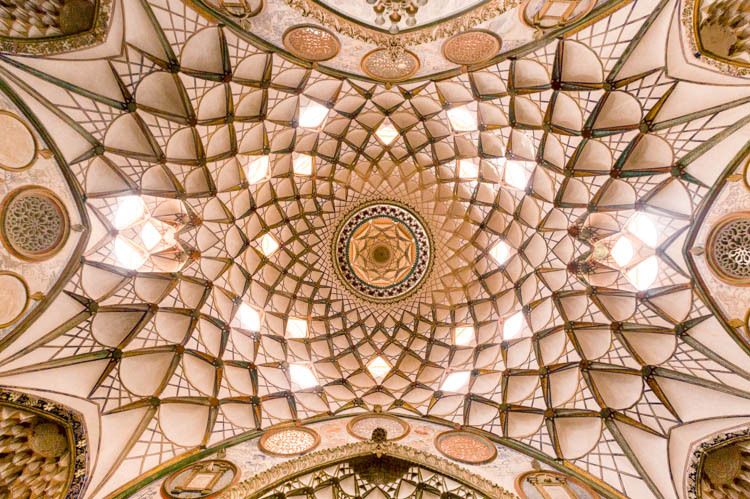 Yet on the other hand, you see a very different form of nice modern European architecture that was oddly out of place. Tip: To fully experience this island at its best, stay for at least a night. That way you can get a more intimate and insightful experience of the locals’ way of living on this island. 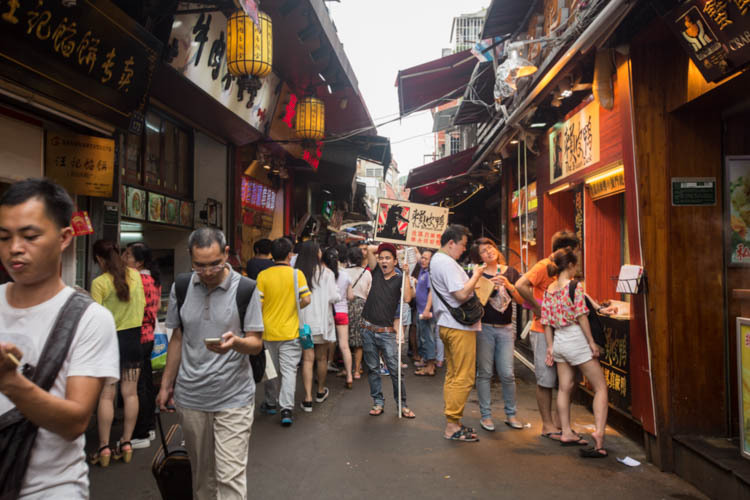 And then you have the streets lined up with rows of different local delights, with some of the stalls selling Taiwanese snacks. This was a scene that was similar to the Taiwanese street markets. The food here was quite expensive though, like all touristy destinations, pricing has obviously been marked up. 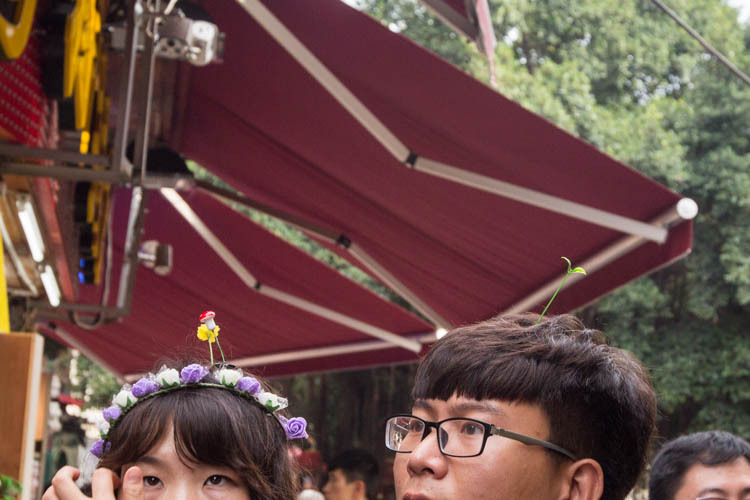 A familiar scene in Taipei? 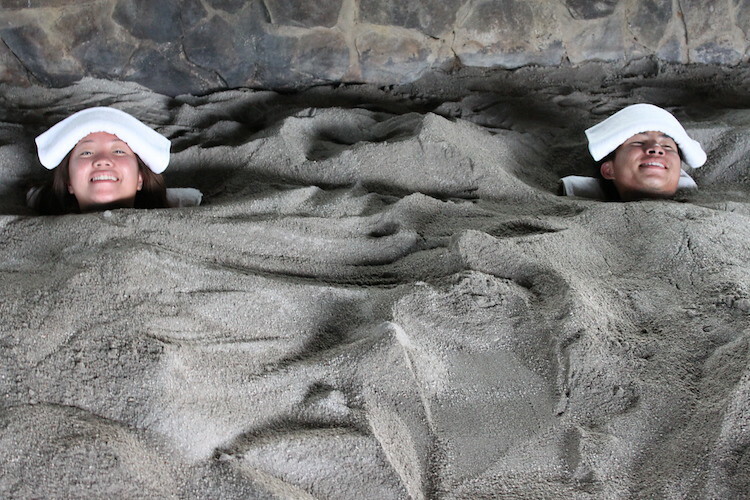 Okay, this has gotta be one of the strangest and weirdest phenomenon that we ever saw! Just check out the series of photos below. 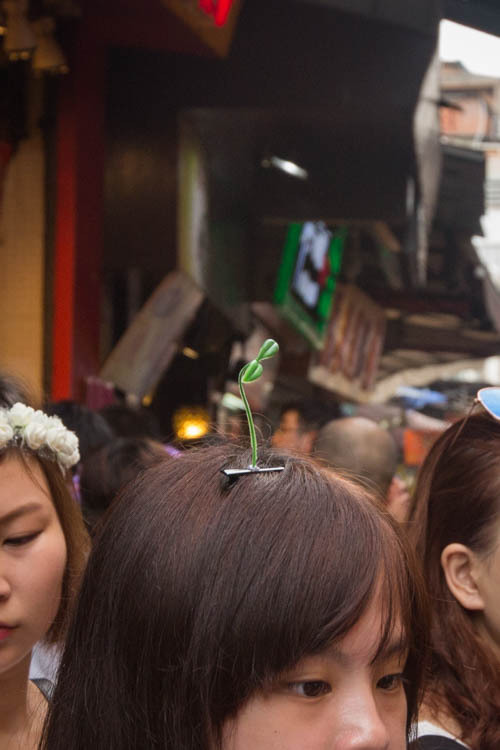 This is apparently the latest trend in China! 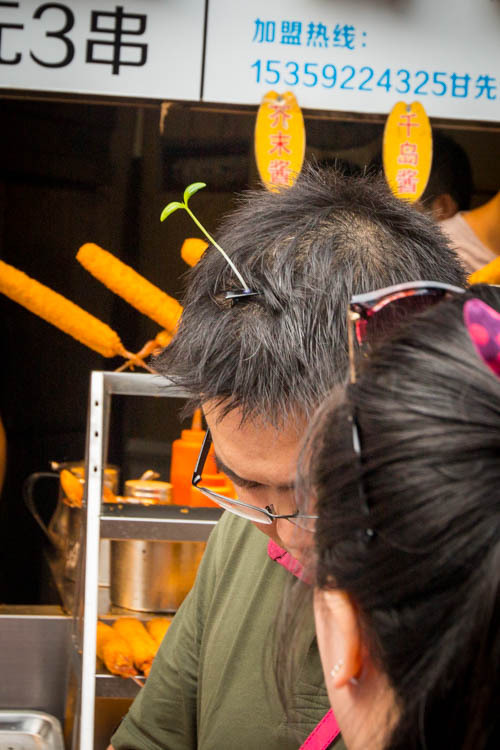 Everybody was sprouting from their head, both guys and females! 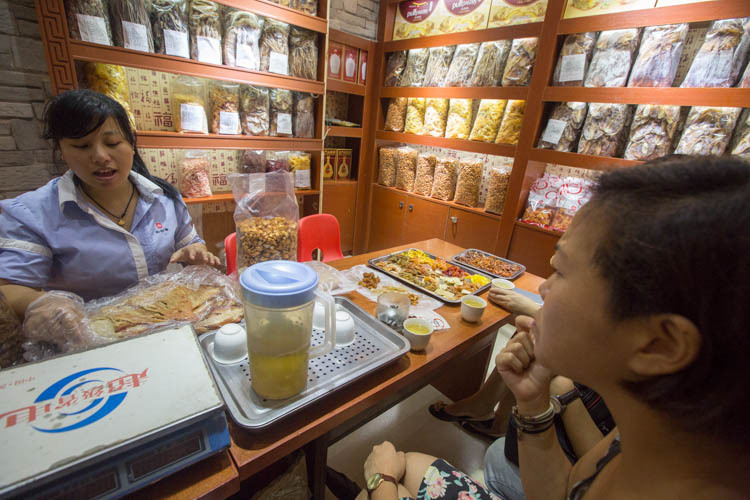 You can also get your souvenirs from this place, a huge variety of dried local snacks. 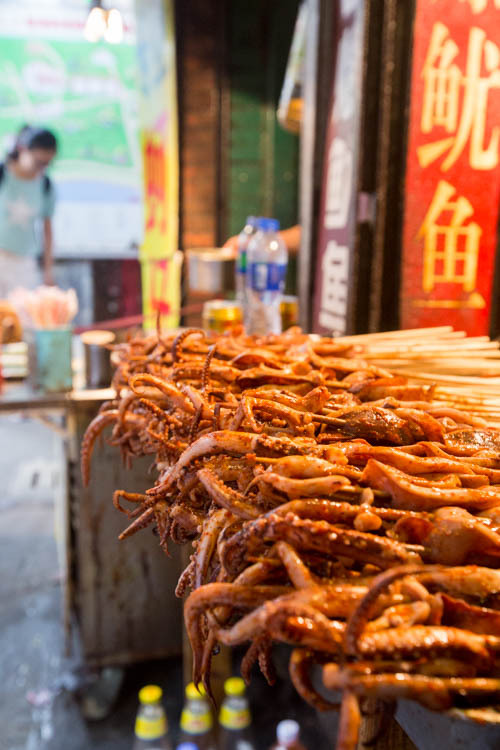 Some of our favourites were the locally dried long an as well as the dried cuttlefish which had no additional flavouring or preservatives added to it. Really yummy! Spoilt for choice with the huge variety of dried snacks to choose from! Nearby the island, there’s a famous coastal drive where you can chill at the beach or even cycle along the coast. We didn’t have much time though, so we only went down to the beach for a quick look. 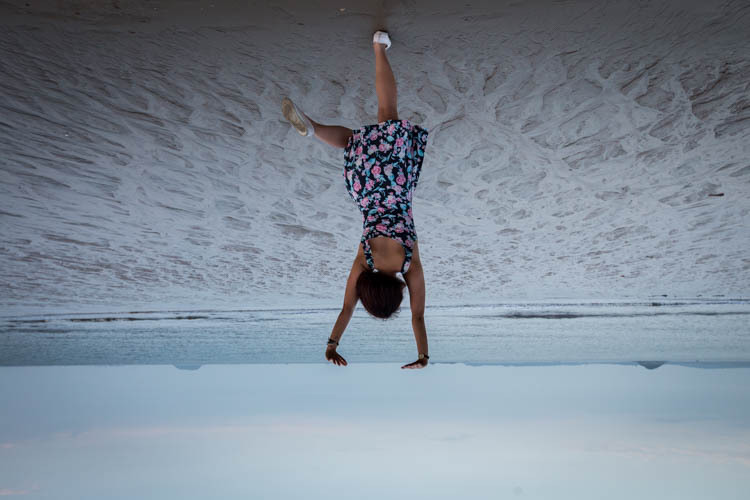 I too can do an inverted headstand! 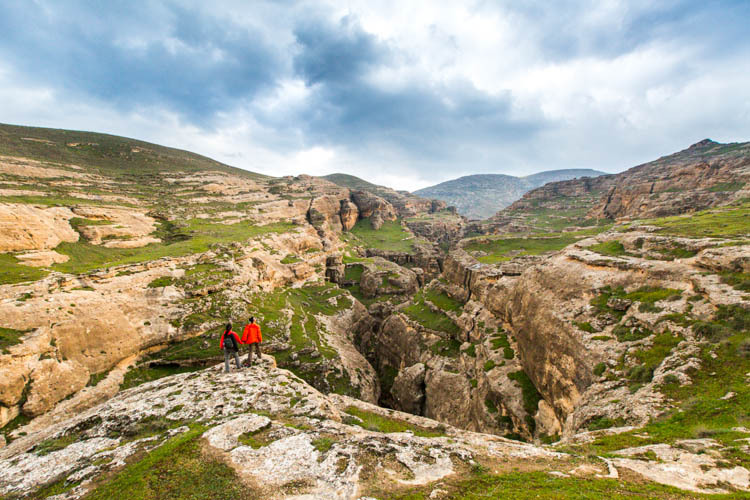 According to our local guide, the locals love coming here for a swim especially during summer! This beach would be flooded with people! It was really low tide when we were there though. So, that basically sums up our short time in Quan Zhou! 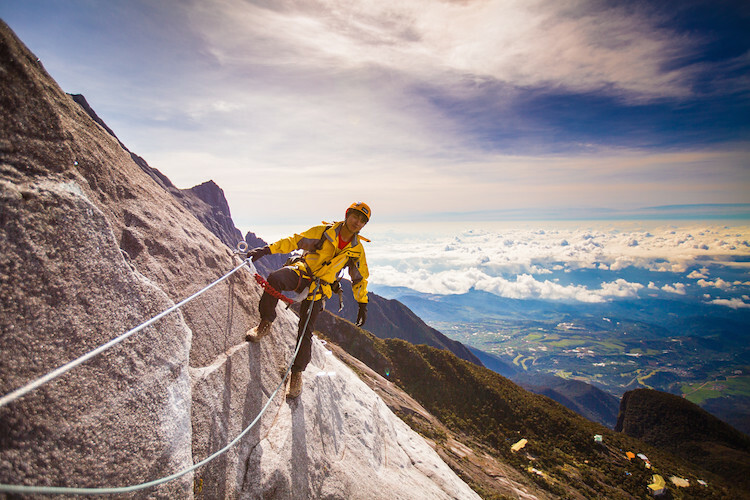 For those of you who are keen to visiting this part of China, Tigerair now flies direct from Singapore, super convenient! On board the inaugural Tigerair flight from Singapore to Quan Zhou! 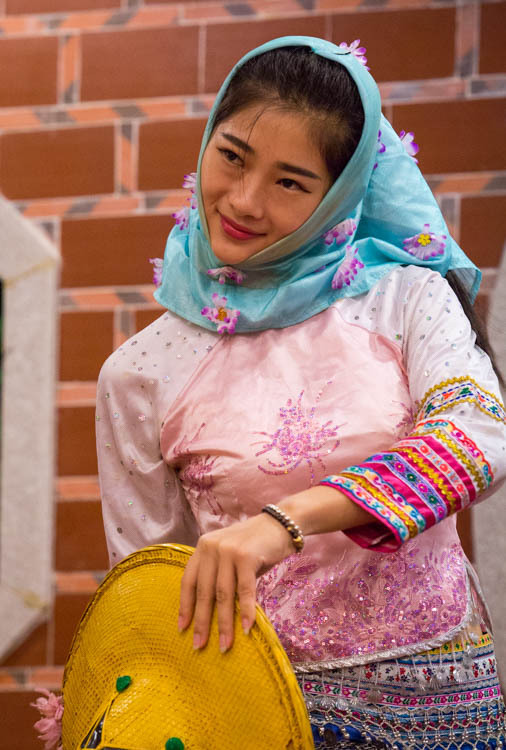 Hope you all enjoyed reading about our short adventure in Quan Zhou! Do you have a favourite city in China? Share it with us in your comments below!